Does Cerulean Wisps completely change the color or just add it? do colorless creatures count as mono colored? Flooremoji: So I started doing some counting and about halfway through realized a lot of the info was useless for this discussion lol. 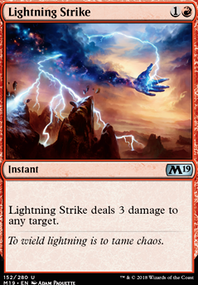 "removal" can be defined differently if we are talking about how it relates to Lone Rider Flip, as bounce spells become more useful, but things like Lightning Bolt become almost useless after a flip. It's kind of hard to judge in that case. As for the average each deck has, that highly depends on the color combo. Red decks can certainly have access to plenty of burn. Black plays nearly the full suite of Doom Blade effects (no Ultimate Price right now. Also no Snuff Out .). A GW deck could have almost none or plenty with Swords, Oblivion Ring , and Nature's Way . It just comes down to the random elements. Yiggler: Yeah, you're definitely right on that. Though, admittedly, I would probably be playing them both in the same deck fairly often, and would probably still consider using the bonds on lone rider that way in some circumstances. I think a different way of thinking of it is that bonds of faith on lone rider becomes an aura with "Target creature gets +3/+3 and trample." That's pretty good in that scenario. Dont know what you are trying to do with the deck since you have several cards for others builds in here.Dont see a use for Bloodbond Vampire since you not gaining much life.Bloodhusk Ritualist for my deck wasnt that good. Kheru Bloodsucker not worth since you dont have my creatures for it.No reason for him at all unless its a fillerSkeletal Changeling.Chainer's Edict feel like there are better things that do this. Planar Bridge tutors are better. 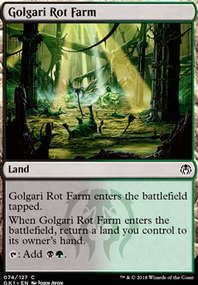 Not the best for how you have this deck built right nowBlighted Fen. Geier Reach Sanitarium dont use lol. Piranha Marsh use a Swamp. Not worth it Sorin's Thirst. Wound Reflection great card but not made for this deck. Is this deck meant to be more budget friendly? I ask because of Ultimate Price and Doom Blade being in the sideboard instead of something like Lightning Bolt or Dismember. Ryjo on Is there a “reverse” Terror? 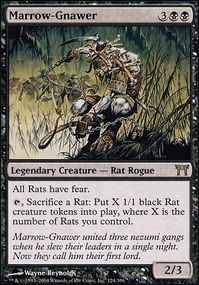 Some of the 2 CMC or less black instants that allow you to destroy black creatures include: Devour in Shadow, Disembowel, Fatal Blow, Fatal Push, Feast of Dreams, Gang Up, Go for the Throat, Hero's Demise, Human Frailty, Killing Glare, Smother, Soul Rend, Ultimate Price, and Victim of Night. Some of the 2 CMC or less black sorceries that allow you to destroy black creatures include: Bone Splinters, Death Stroke, Defeat, Do or Die, Feast of Blood, Imperial Edict, Liliana's Defeat, Murderous Compulsion, Reave Soul, Severed Strands, Soul Reap, Walk the Plank, and Wretched Banquet. Sensei's Divining Top - top goes infinite with either of your infinite mana combos. Infinite as in it draws you your entire deck. After Isochron combo gives you infinite mana you can tap Top for draw, hold priority to activate DReversal via Isochron (paying , but since you have infinite...) and then when that resolves you tap Top again with previous top effect still on the stack. They both resolve, first one drawing a card ad putting Top on the top and the second one just drawing you Top you can replay (for , but, again, you have infinite). And with Rings combo you tap top for draw and copy the effect via Rings (paying while having infinite is insignificant). It's a neat interaction for when Oona is offline for any reason because you get a chance to draw a way to get her (back) online. So even though it's not a combo-centric card and would be included anyway, it would be nice for clarity if it got mentioned in the combo section of the writeup and if it got tagged as such in the deck. Unsubstantiate - tag it as a counter too. The only excuse I can find for playing this over a simple Unsummon or Disperse as a removal is its countering clause. Additional counter that can hit uncounterable spells is something. It's no Remand, but with that price tag and soft removal clause one can't, and shouldn't, complain. Mental Misstep - how relevant is it honestly? The way I see it, your (partially "our") meta is kinda slow so this one isn't as significant here. Spectral Shift - this seems...cute. Too cute. I get the point of abusing Urborg, but IMHO it's jumping through some considerable hoops just to get more mana. Unless I'm missing something big or it's that good and consistent actually. Long-Term Plans - you have plenty good tutors in here. This one is the slowest and I could see it getting out for something better. Mind's Desire - I can see it having a fabulous ceiling, I played the card so I know, but its floor is awful and it won't get you back when you're behind. And even when it gets rolling, you're depending on luck for it to do anything. I think that your current combos are reliable enough to ditch it. But that's just me. Snap - you be the judge on this one. Since you already have black I think you could afford more...permanent solutions to pest problems. But if its free casting is that valuable, by all means play it. Prismatic Lens - take a look at this one. It's not much on its own, but considering you have many colorless rocks and that you only have 4 of those capable of creating infinite colored mana (Talisman pains you so it's technically not infinite but you don't need more than a few with Oona so it fills the bill). 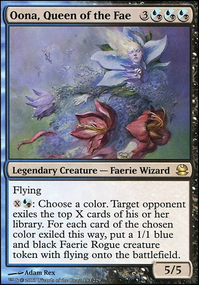 It's a card I came across recently and am seriously considering for my Tasigur so yea, you might find it appealing too. 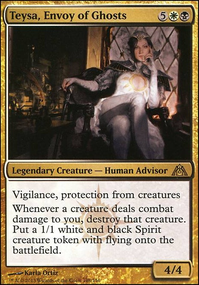 Yahenni's Expertise/Languish - these are neat mass removals that won't break the bank while they will get rid of most stuff from the board. Toxic Deluge or Damnation would be better of course, but I can see that their price tags might be a bit prohibitive so one of these 2 -/- wraths can do, at least for the time being. Go for the Throat/Ultimate Price/Dismember - not all of these are excellent, but you could play some/one these before soft removal in a deck with access to black. You probably want more instant speed removal to deal with Voltron creatures, as well as non-targeted removal. You can try Curtains' Call, Dismember, Doom Blade, Geth's Verdict, Go for the Throat, Hero's Demise, Hero's Downfall, Malicious Affliction, Murderous Cut, Reckless Spite, Slaughter Pact, Snuff Out, Terror, Ultimate Price, Victim of Night, and Vona's Hunger. Attrition is also good if you have Zombies to sacrifice. Glaring Spotlight and Arcane Lighthouse are useful for dealing with hexproof and shroud.